Beautiful Stella York fit and flair. Ivory lace and tulle over regency organza with clear shimmer beading, gown has a subtle almond undertone. Lace appears to float across the chest and back of the sheer illusion bodice. The shimmer beading creates a lovely, tasteful sparkle from the hem to the bodice. 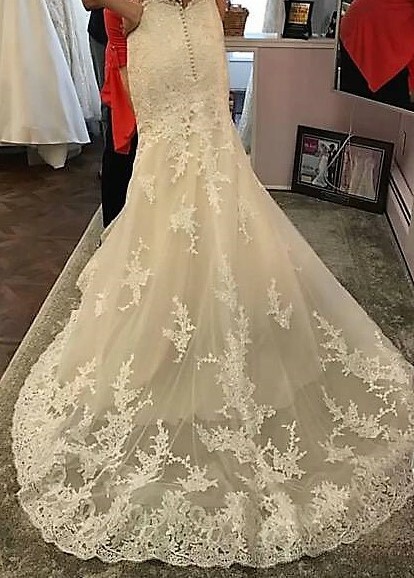 (see picture 6) When the dress arrived and my daughter tried it on for the first fitting, she was broken-hearted, as it didn't still feel like "THE" dress. 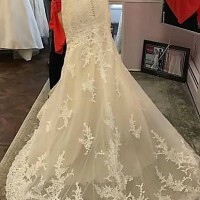 After much discussion about possible alterations and adjustments, we agreed it was time to move on and not do anything that could affect the integrity of the dress,with the hopes that someone else would make it their perfect wedding day dress. It is a stunning dress, beautifully tailored and was purchased from an exclusive local boutique. Intended for a July wedding, it has enough weight to be suitable for most seasonal options. The dress has been bagged and protected since received and only put on for taking photos while standing on a spread so it didn't touch the carpet. Included are 4 extra lace segments we ordered in the event they were needed for alterations. Please message with interest and offers. It's almost time for your big day, we hope you'll consider this beautiful dress and make it your "THE" dress! Once you send a message, SABRA can invite you to purchase the dress.